I’ve decided to start a new Saturday series here on MBIP. I enjoyed doing the Tasteless and Somewhat Crude MBIP Saturday Cartoons, but there’s only so many ways to make a cartoon vulgar and I feel like it has run its course. I like to keep it simple on Saturday and I thought it might be fun to just go and take pictures of local storefronts and highlight those on Saturdays. I always like to support local business here and this should be fairly simple to do and fun to look at. One of the more unique storefronts and one of my favorite stores in town is the Younger Than Yesterday record store, so I thought I’d start there and that’s exactly what I’m going to do! Here we are at the Younger Than Yesterday Record store, owned and operated by Craig Moore. This store has been in operation here on University Street since 1998 and is one of Peoria’s most unique storefronts. Let’s take a closer look at the elements of this storefront. Here’s the front windows. It’s not a true panoramic shot, I took three photos and stitched them together in Photoshop. I think this is the only Peoria storefront with rooftop decorations. The two single records were made and designed by Bob “The Whale” Miller” and The Kiss piece of art was done by Rich Joupperri. The singles are “That’s All Right” by Elvis Presley and “I Want To Hold Your Hand” by The Beatles. Yeah, yeah, yeah. Craig did all the window display designs and the left window includes neon lights, album covers, incense, a stuffed bear perched on a record player and Johnny Cash flipping the bird. The door that leads inside has the logo splashed on it along with the street number, flyers for concerts and the solution for the clueless in life. 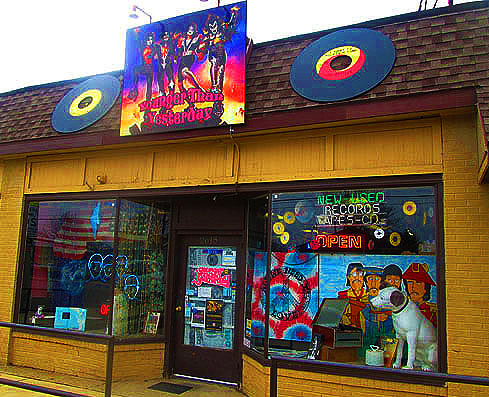 The right window features more neon, more records, tie dye art, a Beatles painting by Bob “The Whale” Miller, the RCA Dog and another record player stacked with 45’s. Here’s Craig holding the album cover of his upcoming LP with Slink Rand, “Return of the Slinkenwolf.” This album will be released at the end of May with a concert at The Apollo to celebrate the release. Stay tuned to MBIP for further information on the album’s release and the concert. Also, Record Store Day is coming up on April 21st and Younger Than Yesterday will be opening up at 8AM with hourly drawings for door prizes, special RSD sales and a live performance by The Golden Fleece starting at 2PM inside the store on the Younger Than Yesterday band stage. 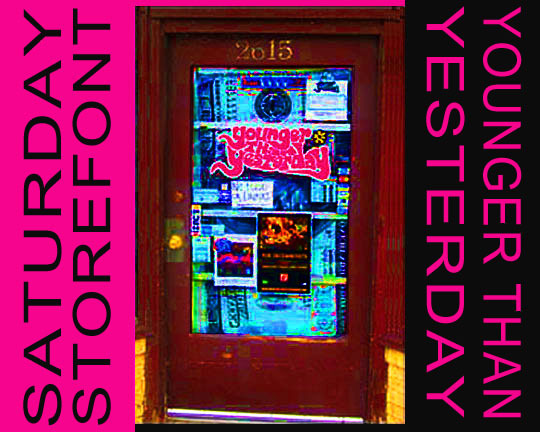 Related Post: Record Store Day At Younger Than Yesterday Starring The Black Roses.